On December 22, 2017, after eight years of study, the FDA has finally granted pre-market approval (PMA) to the fully implantable system for Remodulin. This groundbreaking pump and catheter system allows patients to benefit from Remodulin while minimizing the inconvenience and risks associated with having an external intravenous catheter. However, this does not mean that the FDA has approved the medication-device combination for commercial use. Because the implanted pump also contains a medication, the FDA must also approve the new drug application (NDA). It is very encouraging that the FDA granted pre-market approval but we still don’t know if and when the FDA will grant approval to the entire system that will allow patients to begin to receive the new pump system. The pump has been approved and in use for may years treating patients with neuromuscular problems and chronic pain syndromes. 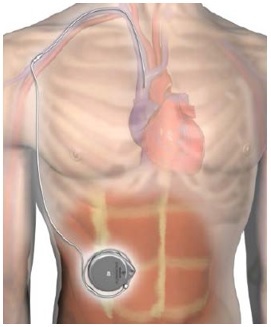 The novel aspect of the system is a new catheter that travels from the implanted pump that is located in the abdominal wall into the blood vessels in the patient’s upper chest/neck, delivering Remodulin into the superior vena cava (large vein near your heart). The procedure to implant the pump and catheter is not without risk and patients need to be well enough to tolerate a sixty to ninety minute surgery. The procedure is often done with general anesthesia but may be done under “twilight sedation”. Appropriate patients for this procedure have been using Remodulin and are optimized for surgery, free of infections and able to follow up regularly for pump refills. Problems that can arise during the implantation include problems related to anesthesia, bleeding, blood clots, injury to the lung tissue and other usual surgical problems. The procedure should only be done by a PAH team expert in the care of PAH patients and with extensive experience with Remodulin and with experience implanting this pump. Refilling the pump involves a short office visit procedure that has minimal pain. The refill process must be done by an experienced clinician. The biggest risk of the refill process is that if medicine is injected outside of the pump into your body this could have dire consequences. It is not uncommon to have mild refill reactions with some mild nausea or flushing. When Will the New Implanted System for Remodulin be Available? United Therapeutics is working on the details of bringing this exciting new system to patients. We will have updates soon.